They got in the Christmas spirit by singing All I Want For Christmas Is You on Wednesday. And Mariah Carey's twins Monroe and Moroccan continued to celebrate the upcoming holiday on Friday. 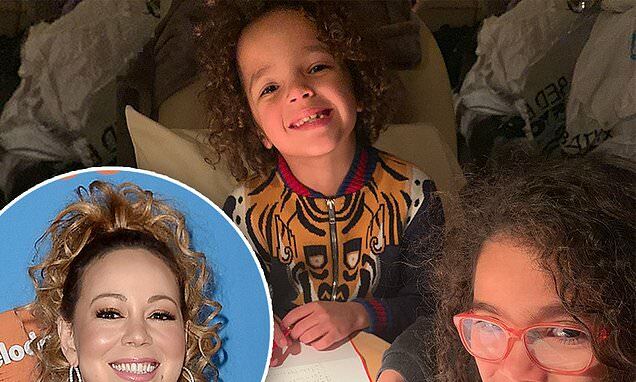 Mariah, 48, posted several sweet snaps to Instagram depicting her two kids writing letters to Santa Claus. 'Writing our letters to Santa! It's a big moment,' wrote the multiple Grammy winner in the caption, before adding a Santa emoji. In the first snap, Monroe and Moroccan, both aged seven, grin at the camera while both holding pencils over their 'Dear Santa' pieces of note paper. Moroccan wears a stylized zip up sweater, while Monroe rocks an adorable pair of orange-frame glasses. The second photo is a single of Moroccan, and the third is a close-up of Monroe's list.